This 40 minute workout created by Chrissy Ruby delivers full body results including core strengthening and aerobic conditioning with the flexibility and focus of Pilates. From jumping to boxing, you will use the moving carriage of the reformer combined with the tension of Slastix® on the tower to create an unlimited combination of exercises. This workout will keep you literally hanging on for more. Thirty-three new exercises are presented. 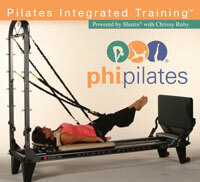 Ideal for personal training or group Pilates classes or sport specific training.